As a spectroscopic method, Nuclear Magnetic Resonance (NMR) has seen spectacular growth over the past two decades, both as a technique and in its applications. Today the applications of NMR span a wide range of scientific disciplines, from physics to biology to medicine. 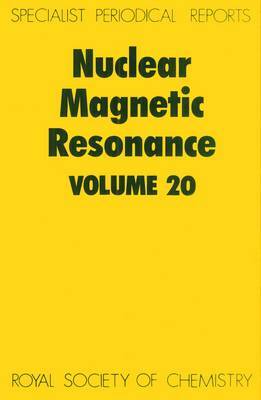 Each volume of Nuclear Magnetic Resonance comprises a combination of annual and biennial reports which together provide comprehensive of the literature on this topic. This Specialist Periodical Report reflects the growing volume of published work involving NMR techniques and applications, in particular NMR of natural macromolecules which is covered in two reports: "NMR of Proteins and Acids" and "NMR of Carbohydrates, Lipids and Membranes". For those wanting to become rapidly acquainted with specific areas of NMR, this title provides unrivalled scope of coverage. Seasoned practitioners of NMR will find this an in valuable source of current methods and applications. Specialist Periodical Reports provide systematic and detailed review coverage in major areas of chemical research. Compiled by teams of leading authorities in the relevant subject areas, the series creates a unique service for the active research chemist, with regular, in-depth accounts of progress in particular fields of chemistry. Subject coverage within different volumes of a given title is similar and publication is on an annual or biennial basis.